DO YOU NEED TO BEAT THE HEAT THIS SUMMER? HOW CAN YOU SAVE MONEY AT THE SAME TIME? ASK US HOW. GET NEXT DAY INSTALLATION ON AIR CONDITIONING STARTING AT ONLY $49/MONTH! ON-THE-SPOT FINANCING AVAILABLE! 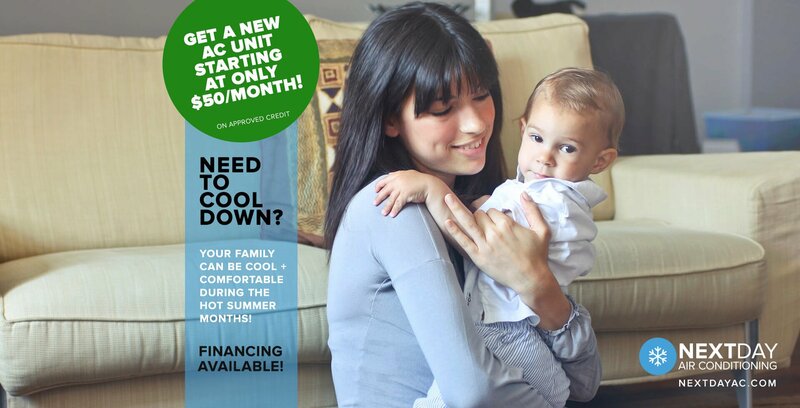 New residential air conditioning financing, rental options and next day air conditioner installations. Starting at only $49/month! NextDayAC.com, a division of GeoForce Energy, is a local company that proudly serves Langley, Surrey, Abbotsford, Delta, White Rock, Cloverdale, Coquitlam, Port Coquitlam, Port Moody, Burnaby and beyond. If you have any HVAC needs or are looking for affordable residential and commercial air conditioning, furnace, tankless hot water heaters and more, please check us out first.